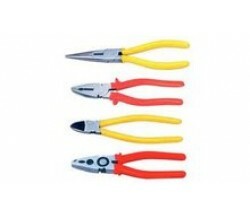 Easier Cutting, Powerful gripping, bending & pulling. 35% less effort required than with convention..
Micro Plating Finish Heavy Duty Design Comfortable Soft Grip Drop Forged.. The Knipex KPX0206200 are a traditional combination pliers with high leverage, eccentric joint for p..
Professional Scew Locking Wire Diameters up to 0.8mm Polished Head Black Lacquered..
100 x Eyelets Pieces Included Heavy Duty Finish.. These Knipex 2506160 160mm VDE long nose Radio side cutter pliers have the capability for cutting me..
Distortion Tolerant, Elastic Precision Tips. Half Round, long, Pointed Jaws. Cutting Edges for Sof..